Although the tale of Sweeney Todd is not for the faint-hearted, it has fascinated audiences for a century and a half in all of its different media incarnations. Most probably written by James Malcolm Rymer and Thomas Peckett Prest, the story of bloody murder and cannibalism first appeared in serialised form as The String of Pearls (1846-7), a ‘penny blood’, the graphic predecessor to the meeker ‘penny dreadful’ stories. Such was the popularity of the stories that the first theatrical performance of The String of Pearls was staged even before the serial had come to its conclusion. Stephen Sondheim’s 1979 Sweeney Todd: The Demon Barber of Fleet Street is thus part of a long tradition of depicting the murderous barber on stage, although the version most people are likely to be familiar with nowadays is Tim Burton’s 2007 film of the same name, starring Johnny Depp as Sweeney Todd and Helena Bonham Carter as his pie-making assistant Mrs. Lovett. Sondheim’s musical proved to be extremely apt for the Welsh National Opera (WNO)’s autumn season, themed ‘Madness’. 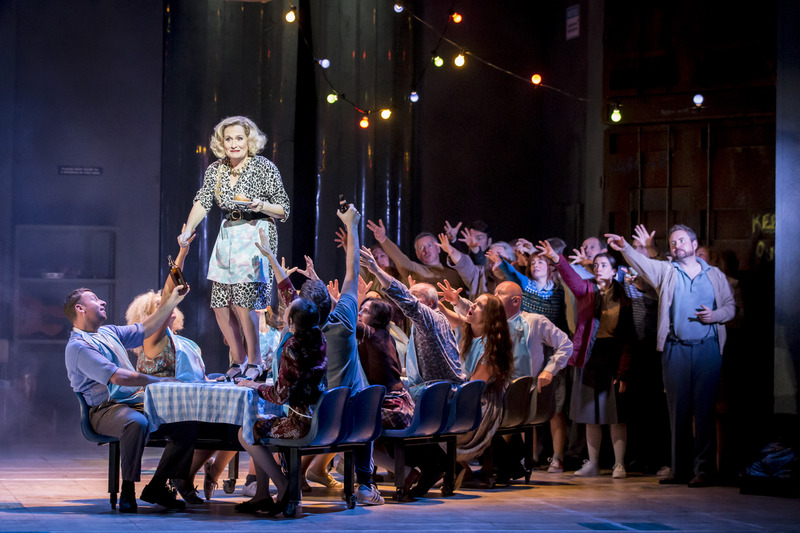 The other two parts of the ‘Madness’ season are operas, Bellini’s I puritani and Handel’s Orlando; Sweeney Todd is the first musical ever performed by the WNO. Though choosing a musical might be a challenge for an opera company, the story of Sweeney Todd is an excellent choice for the season’s theme. Their director, James Brining, has been in charge of Sweeney Todd before: in 2010, he had won the UK Theatre Best Musical award for this production. Where Tim Burton’s film is known for its Gothic setting, Brining shows that the story works just as well in a modern era — Mrs Lovett’s pie shop is a garishly lit establishment with Formica tables and a neon ‘Open’ sign. The Gothic aspect is also set aside in favour of a much more humorous treatment of the story, making this a thoroughly enjoyable horror show, paradoxical as this may sound. From the moment Mrs Lovett (Janis Kelly) opened her song ‘The Worst Pies in London’, the audience was sold. Kelly presents an extremely witty Mrs Lovett, and with excellent timing takes every opportunity to let the audience enjoy even the slightest innuendoes and smallest joking gestures. Even so, her humour is well-dosed, and does not get in the way of the touching emotional scenes in which Sweeney Todd confronts his family history. In a production that emphasises humour, the role of Sweeney Todd can be a difficult one to fill. Make him as funny as Mrs Lovett, and the show will descend into slapstick; make him a maniacal madman, and the chemistry between the two will fall flat. David Arnsperger presented a brooding Sweeney Todd who can be swung into strong passions by the memories of his wife and daughter: a convincing balance between the excessively maniacal and the pitiably tortured man. Throughout the performance, he kept aloof even while upholding the pretence of amicability, proving how utterly Sweeney Todd has lost faith in all of humankind. This is one of those rare shows where the cast is uniformly strong. Blood-splattered, they greeted the audience at the curtain call. Undeniably, the gruesomeness of the story is also its most attractive aspect, and Brining plays into this by making the gory parts some of the funniest scenes of the performance. Even so, several audience members audibly cringed during the slaughter scenes, although spurts of blood were to be expected — why else are audiences throughout the centuries so fascinated with the demon barber of Fleet Street? 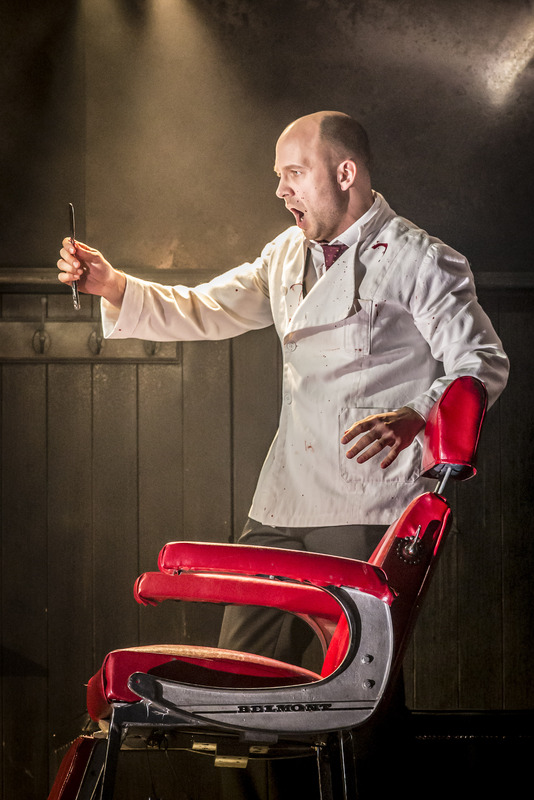 ‘Sweeney Todd’ continues to tour the UK; for more information and future dates, please visit the WNO website.